These days, many authors or websites prefer to post an image along with the blog post so that readers can get an idea right away what the blog post is about. From the design prospective also, posting an image makes your blog post looks interesting and it catches more attention. Recently in 3.60 version, nopCommerce added a feature in the blog section where store admin (or authors) can post a blog overview so that whole blog post is not visible on the initial blog page. But, there is no additional feature out of the box to add (or upload) an image for your blog post. Today, we will go over the process of adding an image to blog post as a workaround. 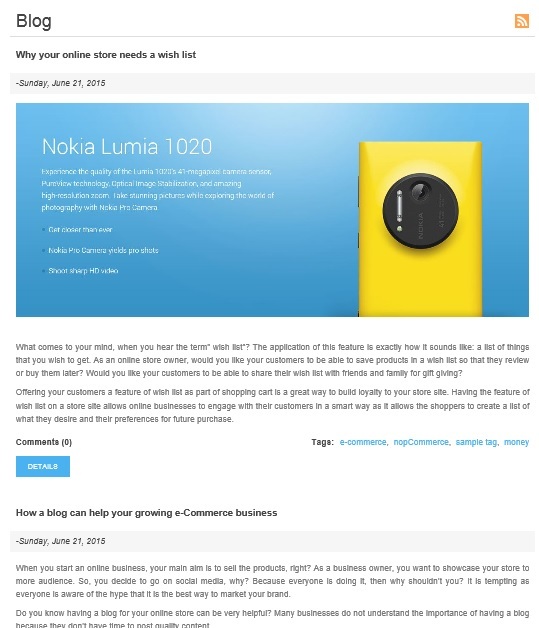 Recently, I received an email from one of the nopCommerce user in regard to the question about adding blog posts on homepage. Adding blog posts on homepage is not a very difficult task but at the same time it is not very straight forward also for developers who are new to nopCommerce or ASP.NET MVC. So, today I am going to demonstrate all the necessary steps required to accomplish this task (i.e. adding blog posts on homepage).